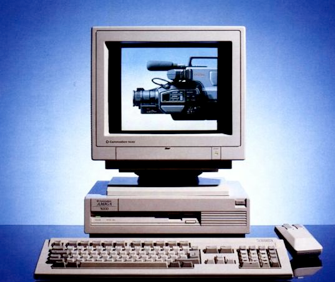 The Amiga 3000 is actually a really nice Amiga. It has a fast 68030 processor, built-in SCSI hard drive, external (standard) SCSI port and better graphics than the previous generation. Unfortunately the world was beginning to move towards Windows at this time and Commodore messed up the Amiga brand totally making the number of sold Amiga 3000 quite few. My Amiga 3000 was very generously given to me from my childhood friend Tomas who also is an Amiga fanatic and who formed the group ”The Voids” to be part of the demo scene (in the late 80’s and early 90’s) together with me and my cousin Ola.